SendinBlue 2019 review - why 4.7 stars? SendinBlue is an email marketing services (EMS) provider dedicated to helping businesses grow by empowering them to engage more customers. They set themselves apart from other EMS providers by offering SMS marketing campaigns. SendinBlue’s payment plans are also unique, and they make the service accessible to any business, no matter its size or marketing experience. SendinBlue prides itself on helping businesses grow by making customer engagement easy. The company offers comprehensive tools to help business owners promote the growth of their entire company — not just the growth of their email subscriber list. There are also standard categories like “Newsletter” and “Sale,” as well as the essential autoresponders for transactions and shipping deadlines. Transactional emails have their own dedicated webpage. While the themes are diverse, the overall quantity of templates is lacking. I’d prefer a few more options in some of the categories, such as the “Personal/Blogging” category, which has only one template. And I’m also particularly surprised that SendinBlue provides only one template in the “Ecommerce” category. 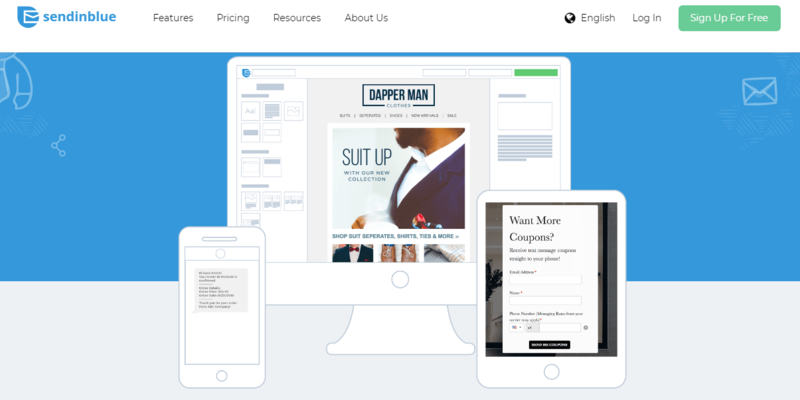 SendinBlue’s customers are business owners, so they should be offered more than one template related to e-commerce. While the selection will probably meet most needs (especially for beginning marketers), there’s room for more variety. In terms of design, the templates are clean and easy to read. However, they’re rather basic and not particularly impressive. 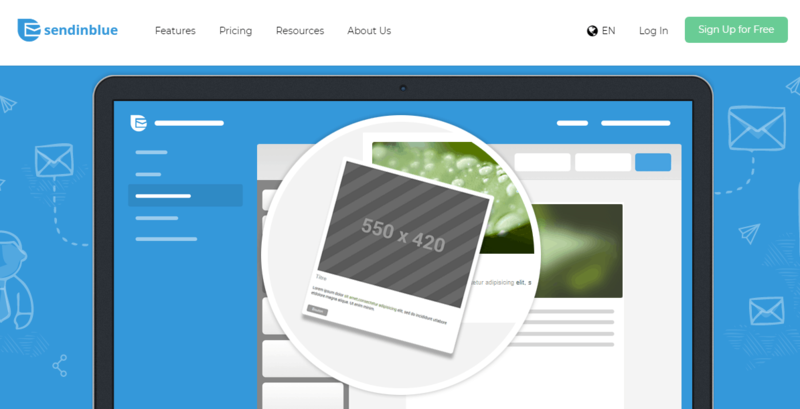 If nothing from SendinBlue’s template gallery appeals to you, the platform lets you build your own template or upload an HTML file. However, empty templates can get overwhelming, and I prefer to start with the guidance that a pre-built template provides. Email is not necessarily the fastest way to get eyes on your campaigns these days. If you need customers or subscribers to see your messages fast, you can text them. SendinBlue stands out by making that possible for their customers. An SMS campaign is a text you send directly to customers’ phones. It can provide a coupon code, announce a sale or a new product or service, or tell your customers anything else you want them to know. 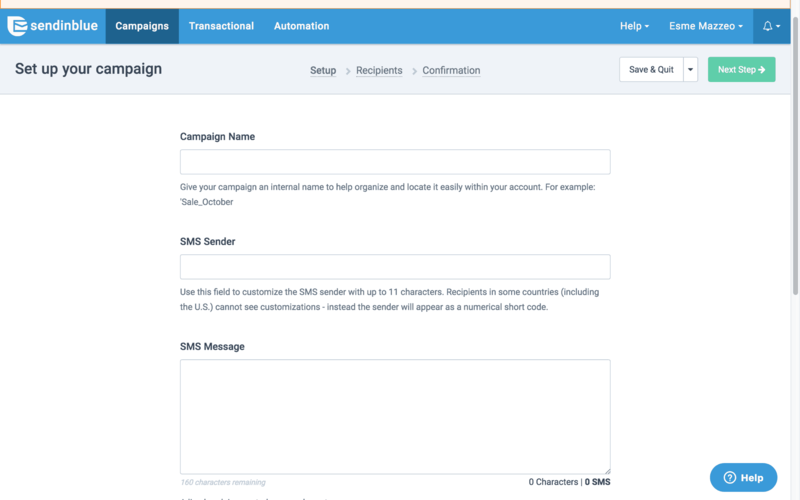 You can write and send SMS campaigns using certain features that are similar to those offered by SendinBlue’s email campaigns. Just import your contact list (including cell phone numbers), and create filters to send the campaign to specific contacts. Then you can schedule and analyze results as you would any other campaign. Premium text messages are 160 characters, and the rate depends on the countries you wish to send messages to. Segmentation is a common feature for many EMS providers, but SendinBlue stands out from competitors because of its dynamic lists which automatically add contacts for you. This is impressive because of what a huge time-saver it is. Your job is to run your business, not constantly update contact and subscriber lists. SendinBlue will add contacts to lists for you based on criteria you set. For example, I created a list of “Clickers” to send a discount code to so I could thank them for loyalty, and another list for “Non-readers” to whom I offered an incentive in the subject line so they would click. SendinBlue makes it easy to sync your account to your website so you can keep track of all your reports and data. You can create personalized subscription forms and landing pages and integrate them into your website. You can also easily add e-commerce plugins like Shopify, WooCommerce, Salesforce, WordPress, and more. I was impressed with how many platforms were included (seven in total), how easy it was to find the plugins, and how fast it was to get the systems integrated and working together. There are 40+ plugins to choose from. Integration isn’t a new concept today. But the variety of apps that SendinBlue offers means that it can function as so much more than just an email marketing service. 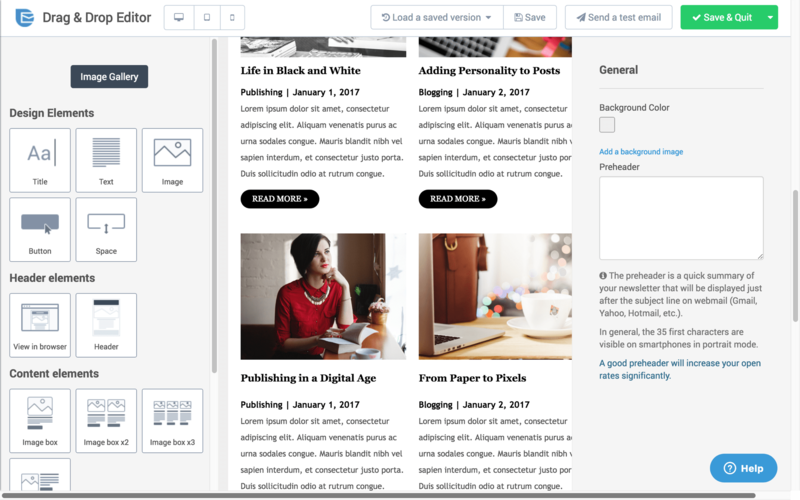 With SendinBlue, you can use a drag-and-drop editor or a rich text editor, or you can paste in your own HTML code. I tested the drag-and-drop editor. The editing screen is too cluttered for my taste. The screen is split in thirds when halves would suffice. One section seems dedicated to a pre-header box. Pre-headers are important, but they’re supposed to be only 35 characters max; putting the box inside the editor is distracting. I don’t like that I had to scroll horizontally to see the full width of my email. The actual editing process is easy. I can drag and drop images into a gallery to use as I work. It takes a while for images to load sometimes, but the wait isn’t unbearable. 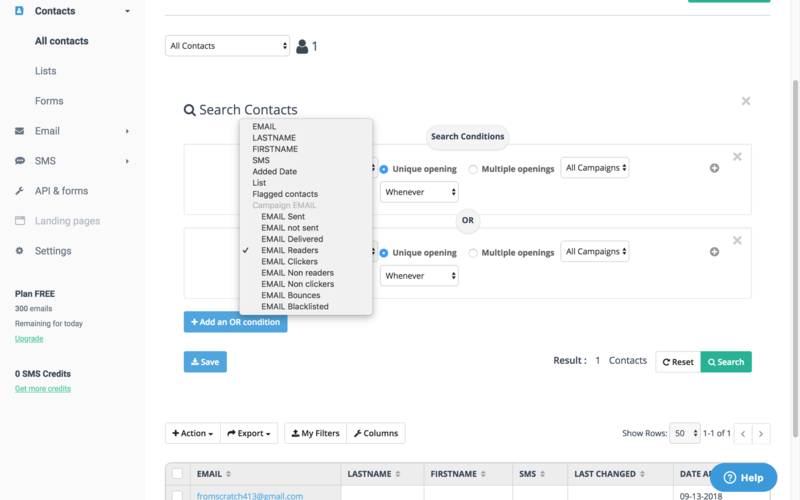 And I found the contact list webpage, search field, and organizational system to be simple and faster to learn in SendinBlue compared with other competitors’ websites. One tool that stands out is the preview feature that allows you to see how your email will look on a desktop, tablet, or mobile device. I was able to make changes to my design when I saw that my original draft didn’t transfer well on a mobile screen. Customer support is unfortunately extremely subpar. There’s a resources webpage that covers a variety of topics like email and SMS campaigns, transactional emails, contacts, deliverability, GDPR (General Data Protection Regulation), and more. The information is presented in FAQ style, and while there seems to be a lot of questions addressed, sometimes the answers are a bit short and seem to be lacking. Support is offered in six languages, including English, which is impressive. I appreciate that there are videos and screenshots for certain processes like using the drag-and-drop editor. But if you need more help than that, things get difficult. Adding a chat feature would fix this problem. I was disappointed not to see one. The email ticketing system is in the “Contact Us” section at the bottom of the main webpage rather than in the resources section where people would naturally go to try to solve a problem; there’s only a general “Support” category for problems. I was hoping to see more specific subcategories to help easily define problems and connect customers with experts. I sent a general question about plan features and heard back within one business day, as promised. But they only rerouted me to another department without answering my question. This likely would not have been a problem with a more specific ticketing system that could have sent my question to the right team in the first place. And Customer Support claims to be reachable by phone, but I couldn’t find a phone number anywhere in the SendinBlue website. SendinBlue has five plans to choose from, and all of them allow you to upload an unlimited number of contacts. Pricing depends on how many emails you send every month. Upon signing up, you’re automatically given the free plan, which allows you to send up to 300 emails per day, though SendinBlue’s logo will be included. I wish the free plan offered a couple more features to test out. A few free SMS campaign credits would be nice, for example. The four other plans are similar to the plans offered by other EMS companies. If you’re new to marketing, try the “Lite” plan. It allows you to send your email campaigns with no daily limit. This plan will work great for a new business owner trying to learn email marketing. The “Essential” plan gives you everything under “Lite,” but also offers you access to advanced statistics. You can send 20,000 more emails per month, and there’s no “SendinBlue” logo attached to your email. This plan is recommended for growing businesses. “Premium” is the most popular plan offered. This level unlocks the most SendinBlue features, including a dedicated IP address and send-time optimization. It’s recommended for established businesses that are marketing pros. The final plan is the “Enterprise” plan, which is a custom plan with a dedicated account manager and a “services pack.” The website doesn’t mention what the pack includes, but this plan is ideal if you need to send more than 350,000 emails monthly. If you select this option, you’ll be asked to fill out a form detailing your precise business requirements, the number of emails you need to send per month, and your contact info. I recommend that you upgrade to this plan only when you’re sure that you’re happy with SendinBlue’s service. Aside from the standard plans, SendinBlue also offers unique “Pay as You Go” SMS plans and IP plans. The SMS plan especially sets SendinBlue apart from its competitors. 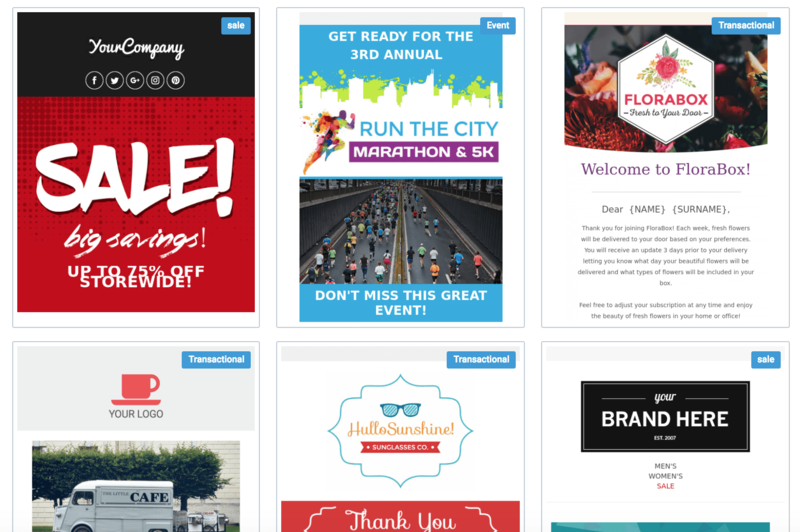 SendinBlue is a comprehensive email marketing service that caters to all types of businesses. The platform stands out in the field by offering SMS and text messaging campaigns alongside traditional email marketing campaigns. It’s also compatible with a wide variety of plugins, which expands the website’s capabilities beyond just marketing. SendinBlue offers dynamic pricing plans like “Pay As You Go” for SMS. I wish that the email campaign editing screen were less cluttered, and the template section more robust. Overall, SendinBlue is a decent EMS provider, and I would trust them as a partner for all of my email marketing needs.